Walking conditions – Track well-defined footpaths. We sat in the wonderful Kenmore village square pondering whether to travel on the road north or the road south of Loch Tay. We were swayed by the prospect of visiting the Crannog on the south road. However, when we got to the Crannog there appeared to be building works so we drove on for a couple of miles to Acharn village. By sheer chance I had parked next to the sign for the public footpath leading to the Falls of Acharn. Why not go for a walk, we thought? There was a packet of crisps and a Fruit Shoot in it for the children so they were up for it. And what a good impulse decision it turned out to be. As well as the chance to visit the spectacular Acharn Falls we were treated to a great view of Loch Tay and a visit to the Hermit’s Cave. Park in the village of Acharn. It’s a tiny village so it won’t take you long to find the footpath sign on the main road pointing up the track to the Acharn Falls. From there, it’s just a steady ascent up the track for about 650 metres until you come to the Hermits Cave. Perched on the edge of a precipitous gorge this 18th Century folly is well worth a visit. It’s then a very short walk to the falls. If you’re crossing via the viewing platform please keep a hold of your children as, although a magnificent crossing point, a child could easily crawl through the side of the platform (You can avoid this by crossing slightly further up). To return to your car, make your way back down other side of the gorge, again, keeping a tight hold of small children as there are steep drops in places just a few feet from the footpath. This entry was posted in Perthshire and Eastern Highlands and tagged Gorge walks, Perthshire walks on December 12, 2014 by scotlandwalkswithchildren. Walking conditions – Roads, pavements and good paths. Footpath through forest can be muddy. The stairs up Pitlochry Dam are a bit steep. My first impression of Pitlochry was that it is a picture postcard town set within a stunning Highland landscape. However, that didn’t explain why it was jam-packed with tourists and buzzing at all hours of the day. As it turns out one of the main reasons for this lies south of the River Tummel and is the Pitlochry Festival Theatre. 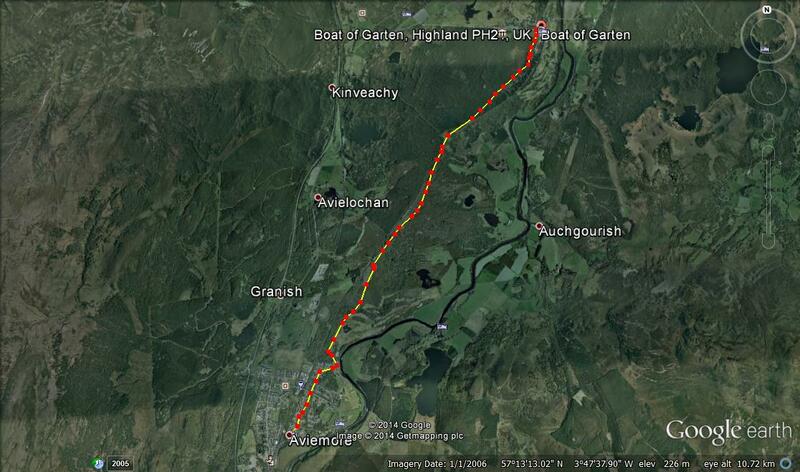 But there are numerous other reasons for Pitlochry’s popularity. Recently, we did a little circular walk form the centre of town to the theatre taking in Loch Faskally by way of the Pitlochry Dam. This short and pleasant walk provided us with a good flavour of the place. Park near the centre of town and make your way to the railway station which in itself is a place of interest. Take the path going east then turn right under the railway bridge. Walk past the car park, cross the road and take the footpath through the forest. 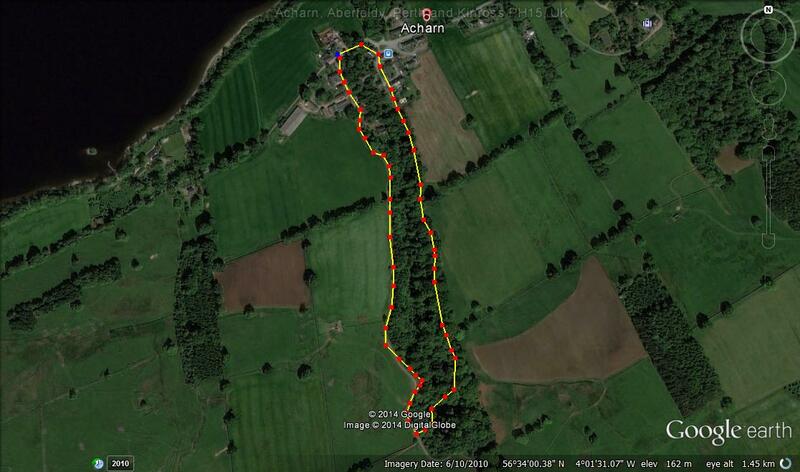 This short forest walk takes you out at a small housing estate. To the left hand edge of this estate is a path that leads directly on to a footbridge taking you over the River Tummel. Turn right and you’ll pass by a very pleasant riverside pub with the theatre up the hill on the left. It’s a great place to stop for a picnic as there are plenty of wooden benches and a great view. Pitlochry dam is also a couple of hundred metres away. Walk along the road then make your way up a series or little stairways and channels which take you to the top of the dam. Cross the dam then make your way back to the railway station. There’s a quaint little footbridge you can cross between platforms. We’ve been to Pitlochry on several occasions and each time stayed at Scotland’s Hotel which was great fun and relatively inexpensive. 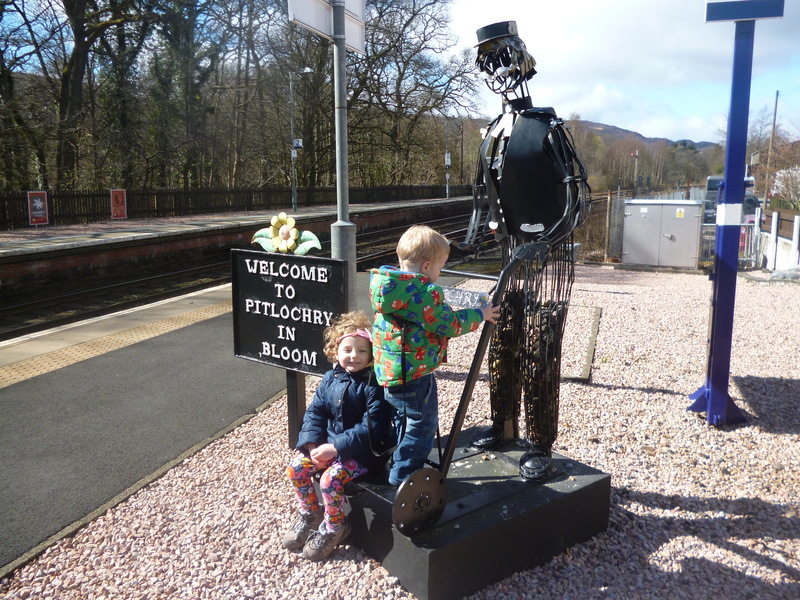 There are always new things to do and explore in Pitlochry and it won’t be long before we’re back. 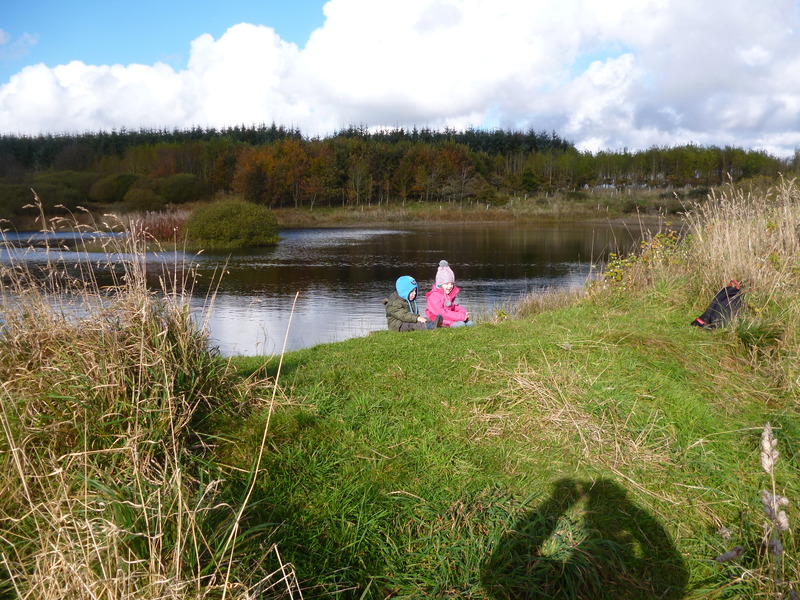 This entry was posted in Perthshire and Eastern Highlands and tagged buggy, Perthshire walks, pitlochry walks on November 10, 2014 by scotlandwalkswithchildren. 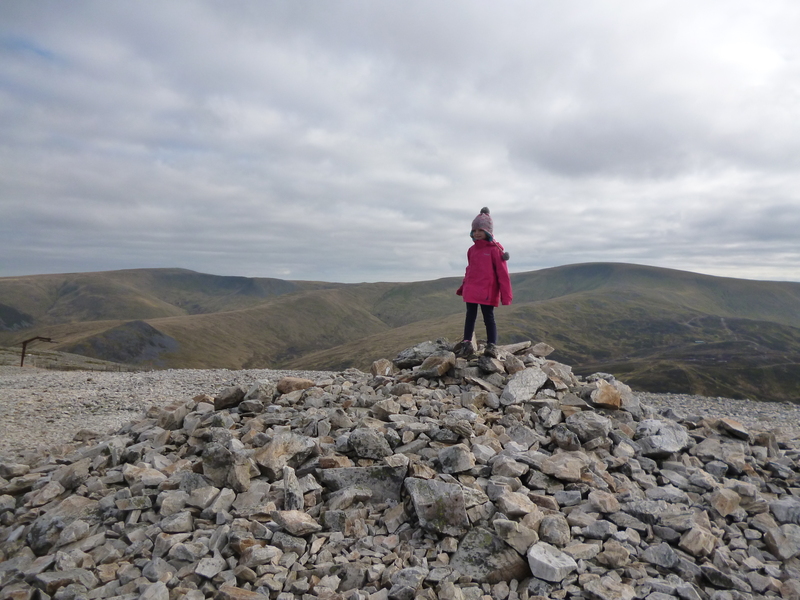 As of 14th October 2014 we can proudly announce to the handful of people who currently read this blog that our five year old daughter has conquered Carn Aosda and she is therefore now a Munroist. 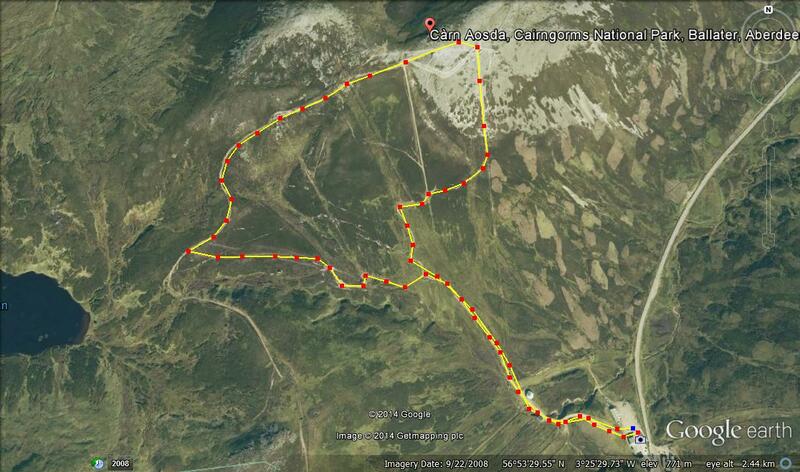 Admittedly Carn Osada is certainly not the most prestigious of Munros and it’s a fairly easy 275 metre ascent. Indeed, she made light work of it, albeit off the back of the usual promises of Haribos and Chocolate Buttons awaiting her at the top. Confectionery wasn’t the only treat at the top of the hill. There was also a crystal clear, breath-taking view and this is something my daughter will soon realise is not a treat to be taken for granted on Scotland’s 3000+ feet hills. Park at the Glen Shee Ski Centre on the A93. At this point you are already over 650 metres above sea level. From here, there’s a short, steep ascent that brings you up to the café. 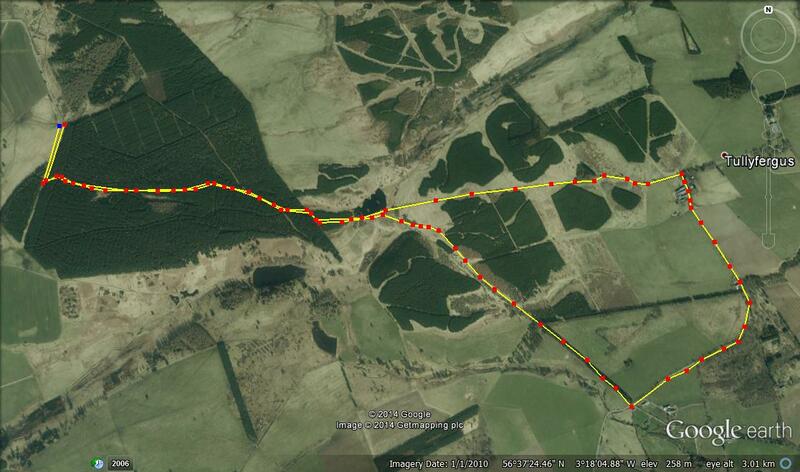 You will now see a number of tracks and paths. Do not head up the direct route to Carn Aosda (that’s the way down) but opt instead for the well-defined winding path that takes you to the lowest point of the shoulder coming down from the summit. When you turn onto the shoulder it actually becomes a very pleasant high level walk with great views and it’s not that hard to forget that you’re close to a series of ski runs. This gentle shoulder takes you onto the summit and a large cairn presents itself. To return, walk down the straight, bouldery path which takes you back to the car park, pretty much as the crow flies. 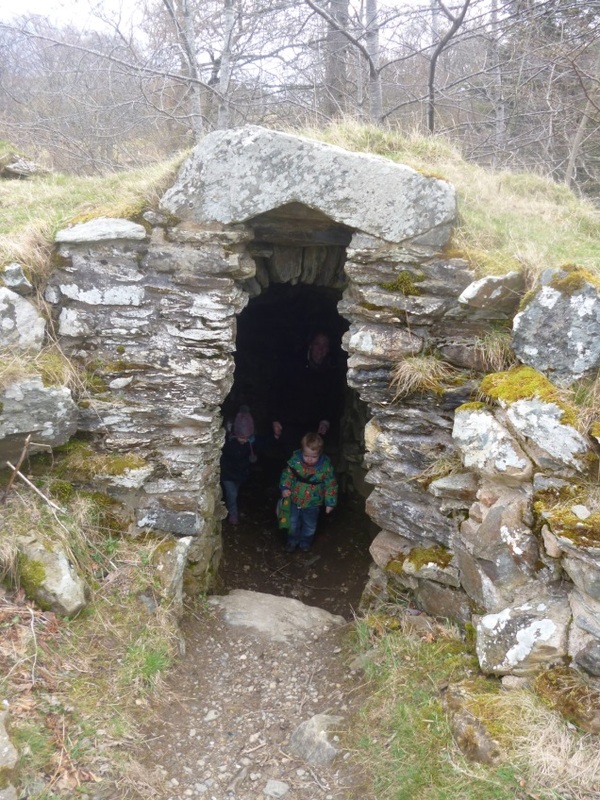 This entry was posted in Perthshire and Eastern Highlands and tagged easy munro on October 23, 2014 by scotlandwalkswithchildren. Walking conditions – Easy walking on forest tracks and good footpaths. Some walking on a single track road. No difficulties. Over the years I’ve passed through Blairgowrie on my way to either Glen Shee or the Cairngorms. On this occasion, for the first time Blairgowrie was the destination and about time too. Blairgowrie is a town with a lot going on. This is certainly the case in terms of walking routes. Whilst driving we noticed numerous public footpath signs. This prompted a visit to the Blairgowrie Tourist Information Office where we received the Drimmie Woods tip-off. What the very helpful assistant failed to mention however, was the weird wooden boards nailed to the trees or the sinister looking wooden spider’s web lying at the side of the forest track. Were we being set up in some ‘Wicker Man’ style occult ritual? Read on……. There is a parking place just outside Drimmie Woods on Drimmie Road which is about 4 kilometres outside Blairgowrie. It is at this point you get a flavour of the fantastic viewpoints which await you should you survive the first 1.5 kilometre walk through the dark, spooky forest with all the Blair Witch style paraphernalia I mentioned earlier. When you exit the tree line within about 200 metres you will see a lochan on your left, after which the path goes in a circuit returning to this point. There will be some walking on a single track road so watch out for the occasional vehicle. When you get all the way around go back through the spooky forest. Run past the locals who by now, are wearing fancy dress and have brought with them a large wooden structure that looks highly flammable. Jump in your car and drive…..anywhere. This entry was posted in Perthshire and Eastern Highlands and tagged Perthshire walks on October 18, 2014 by scotlandwalkswithchildren. Walking conditions – Gravel Footpath. No difficulties. Located on the northern slopes of the Cairngorms and at an altitude of 550 metres the Cairngorm Ski Centre is an ideal starting point for a stroll about the Cairngorms as it offers a network of paths and fantastic views. It also reminds me that I need to go snowboarding soon. The Cairngorm Ski Centre is also next to the entrance to the Furnicular Railway which will take you to a height of 1097 metres and almost to the top of Cairngorm. At this ‘Top Station’ you will also find the Ptarmigan Restaurant as well as shops and a viewing terrace. 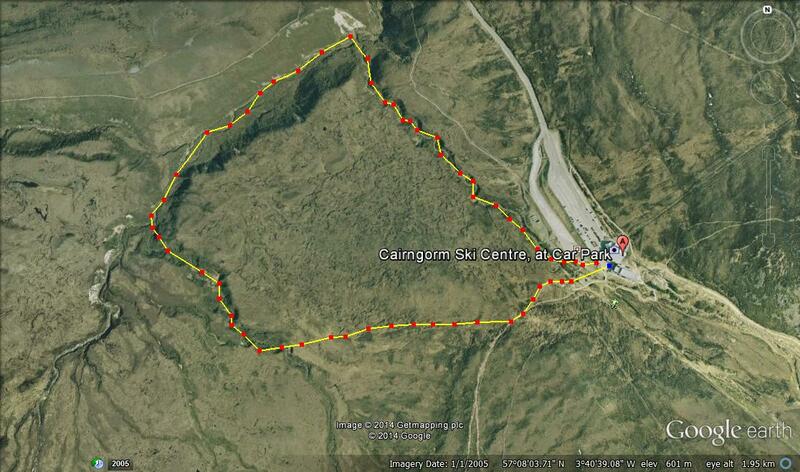 Guided walks to the top of Cairngorm are also taken form here. From the car park walk westwards, cross the footbridge and follow the path. A number of paths criss-cross which is ideal on a clear, sunny day when you can wander around to your hearts content whilst marvelling at the view. However, if visibility is poor or changeable navigation can be difficult so be careful as it’s not that hard to get lost. Our preferred route has been to walk in a 2.7 kilometre loop that initially travels west for a few hundred metres then veers north down the gentle slope. The path further curves around and takes you directly back to the car park. Coming back from the ski centre, it is virtually impossible to drive past Loch Morlich without stopping. It’s one of Scotland’s great easily accessible beauty spots. 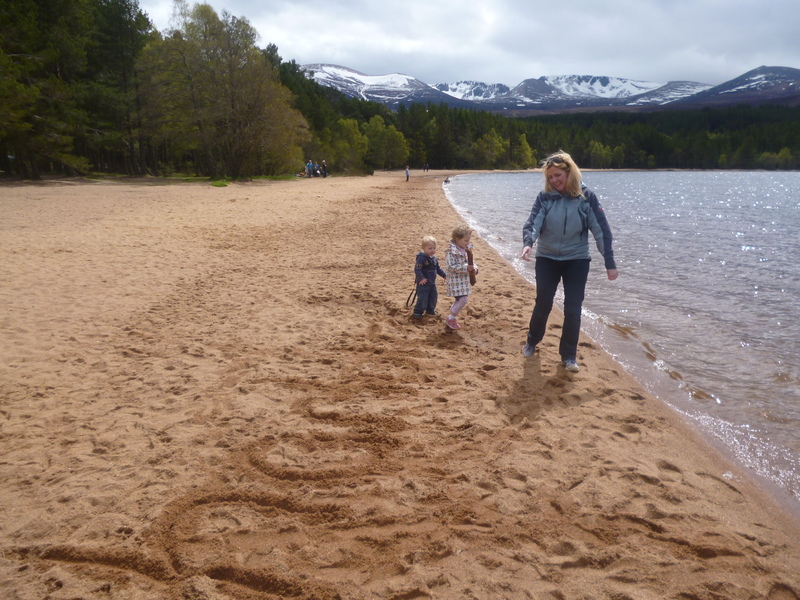 If you park near to the Glenmore Visitor Centre you’ll find easy access to the visitor centre of course, and also to Loch Morlich’s sandy beach and a perfectly located café that features an expansive upper level terrace overlooking the loch. This entry was posted in Perthshire and Eastern Highlands on October 5, 2014 by scotlandwalkswithchildren. Over the past couple of years Pitlochry has become a favourite stomping ground of ours. It all started off with a two day dinner, bed and breakfast deal at Scotland’s Hotel, Pitlochry. We initially thought we had made a poor choice of hotel when the receptionist led us to our room which was in fact out of the hotel, across the road and into a converted house. We managed to keep our cool and a good thing too! This turned out to be one of the best places we’ve stayed in and we’ve been back a number of times since. We have found it impossible to get bored in Pitlochry. We will return again soon and perhaps, unlike last time, even conquer Ben Vrackie. With the theatre just across the river from the centre of town, Pitlochry is always vibrant and there is a tangible party atmosphere about the place. We’ve not been to any wild parties yet but certainly have contributed to the general noise levels and commotion. We’ve also sought out things to do. A visit a couple of miles down the road to Killiecrankie was a particularly good day out and a very pleasant 5 Km walk. 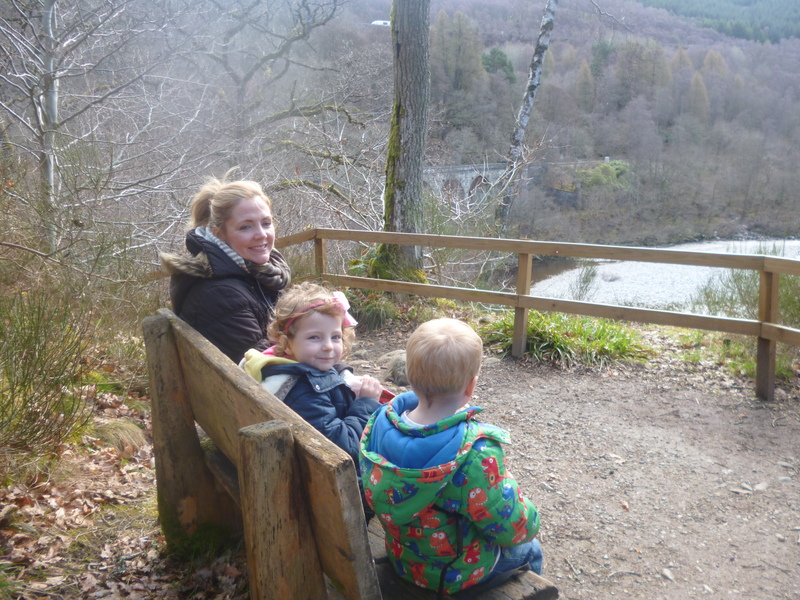 Park at the Killiecrankie Visitor Centre. Take the opportunity to have a walk around this tourist attraction. The staff are really nice and there are some fun things to do for the children. Then make your way to the clearly marked footpath which runs parallel to the River Garry and past The Soldier’s Leap. Keep following this path until you reach the road bridge over the River Garry. Then simply walk along the road as it gently ascends. After about 200 metres take the left fork in the road and after another 200 metres take a sharp left. This road provides an excellent vantage point at it gains about 100 metres in altitude along the way. 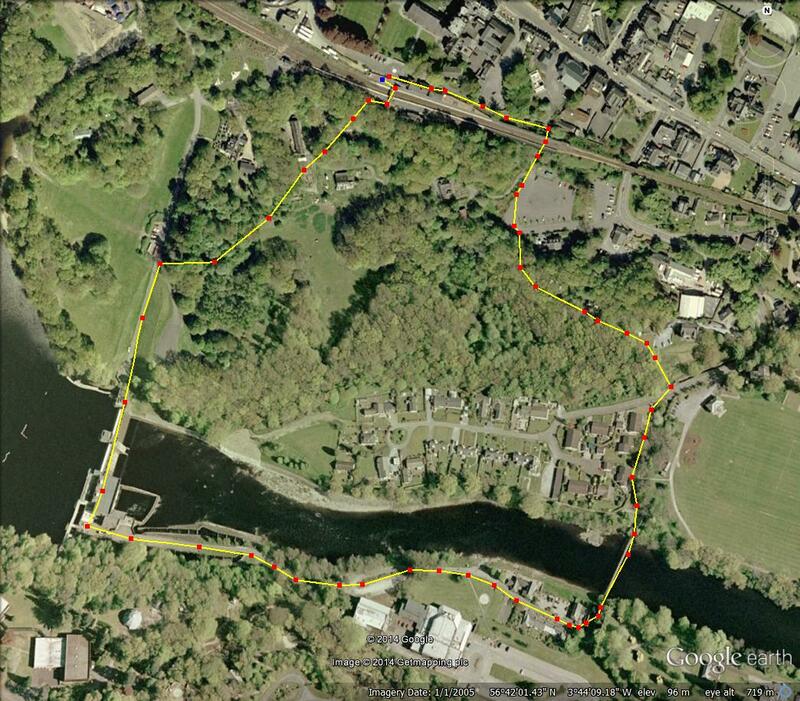 After about 2 Km you will reach the car park next to the bridge. Do not cross the bridge. Instead follow the path beside the river leading north. After about 300 metres cross the footbridge over the River Garry. 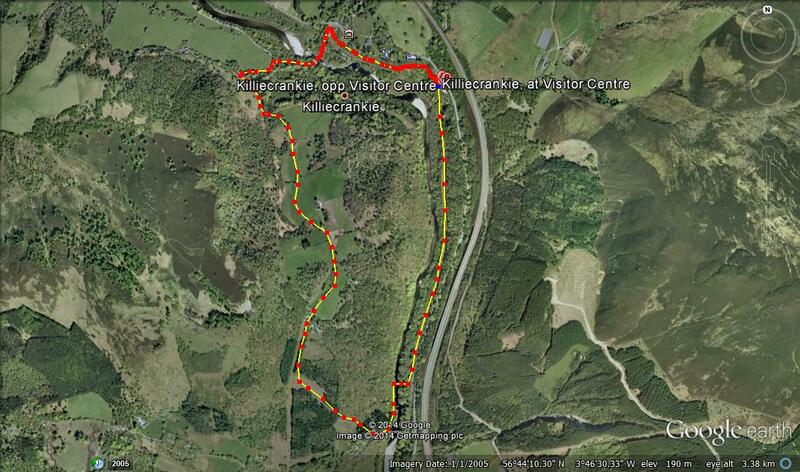 Then follow the path back to the Killiecrankie Visitor Centre. 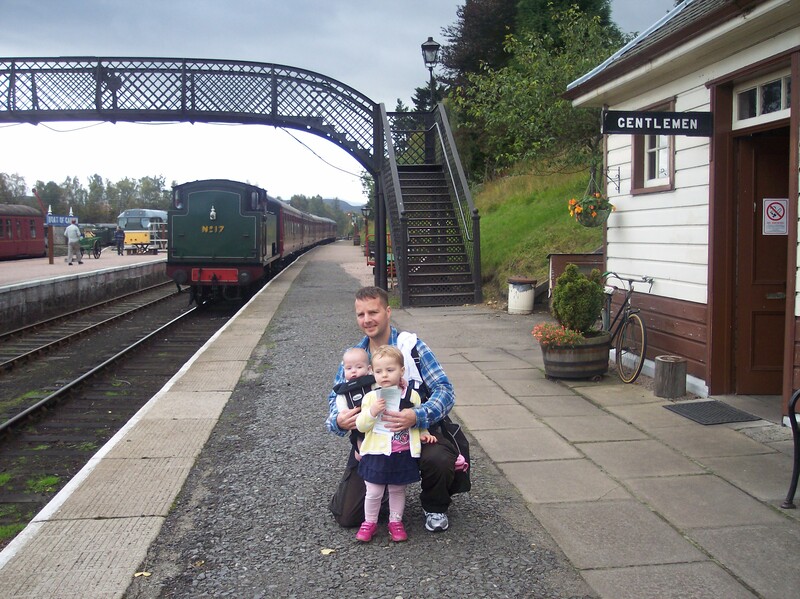 This entry was posted in Perthshire and Eastern Highlands and tagged pitlochry walks, soldiers leap on September 10, 2014 by scotlandwalkswithchildren.